The American Heart Association recently presented Ridgeland Elementary School with a donation of physical education equipment as part of an initiative to encourage local students to develop and maintain healthy habits. Made possible by a sponsorship from Gulfstream Aerospace, the donation included basketballs, soccer balls, baseball sets, tennis racquets and balls, volleyball and badminton sets, and was presented to the school at a school pep rally designed to promote healthy living and physical activity for the youth. 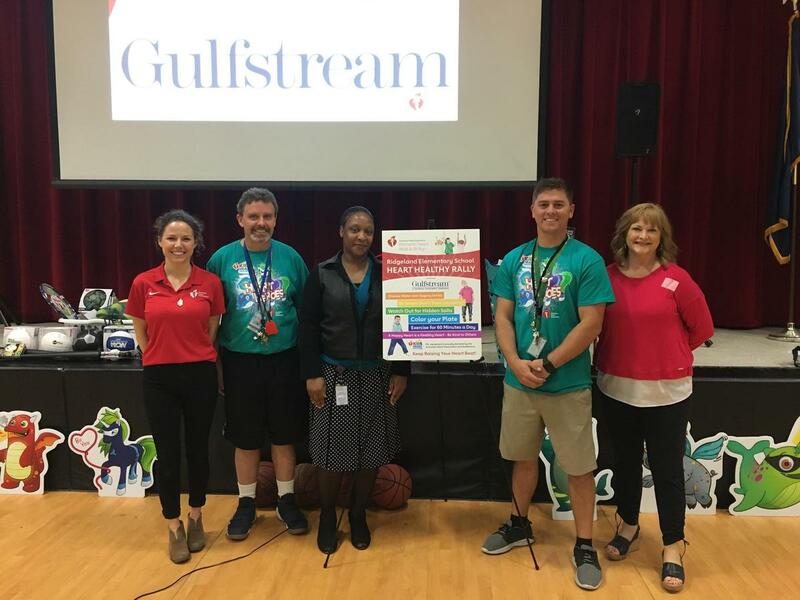 During the rally, Carla Raines and Rachel Stanley of the American Heart Association (AHA) talked to the second-grade students at Ridgeland Elementary about the AHA’s Kids Heart Challenge, a national program that prepares kids for healthy lifestyles by supporting their physical and emotional well-being. The program is designed to educate students on the activities that help keep them healthy, such as learning how to jump rope or how the heart works. AHA representatives also talked about the importance of supporting the American Heart Association and how to keep their own hearts healthy by practicing the following habits: choosing water over sugary drinks, deciding not to smoke, adding more color to their plates, and exercising 60 minutes a day. Approximately one in three American kids and teens is overweight or obese, nearly triple the rate in 1963. Among children today, obesity is causing a broad range of health problems that previously weren’t seen until adulthood. These include high blood pressure, type 2 diabetes and elevated blood cholesterol levels, all of which can lead to cardiovascular disease and earlier death in adulthood. Lack of physical activity is a key factor in obesity and cardiovascular disease risk. Approximately two-thirds of kids and half of adults don’t get enough physical activity. For more information about the American Heart Association youth programs, contact Rachel Stanley, Rachel.Stanley@heart.org.